The Victoria Quarter in the western city centre is an area that is rapidly developing and will be home to thousands more residents in the coming years. Yet despite this, there had been little planned to improve the appalling state of the pedestrian environment to support those residents. This has all been taking place at the same time the council and transport agencies have been falling over themselves in a rush to spend billions on infrastructure to support greenfield growth on the fringes of the city. Much of the area remains unchanged from the time the motorway was built and the local roads are focused on the movement of car with little regard for the safety of pedestrians or those on bikes. Late last year and earlier this year we hosted a number of guest posts from reader David R about this issue. He also spent a lot of time advocating for improvements to the local board and his efforts appear to have paid off with last week Auckland Transport announcing plans to improve the area with most of it focused on improving safety. Auckland Transport is proposing a number of new safety measures, including crossings, shared paths, cycle paths and speed reduction on Cook Street and the surrounding area in the City Centre, to make it safer for people walking and cycling. 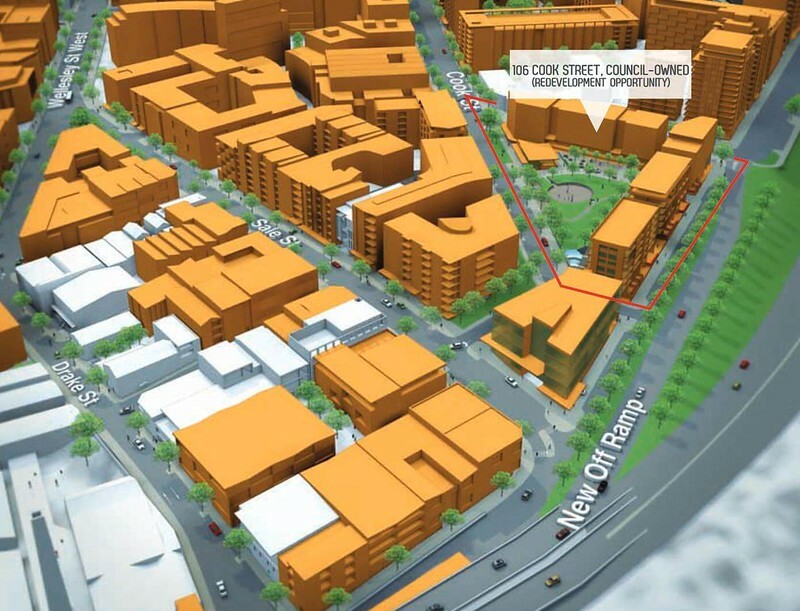 Cook St is one of the high risk corridors in Auckland and is therefore a priority for safety investment. 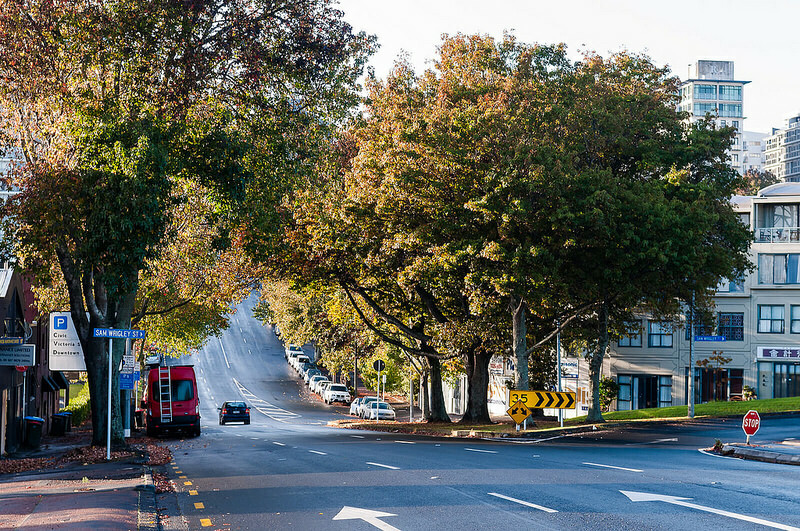 AT is seeking feedback until 28 June 2018 on the changes, including improvements for the intersections of Sale Street, Union Street and Drake Street. Kathryn King, AT’s Walking, Cycling and Road Safety Manager, says new and upgraded zebra crossings, pram crossings, speed tables and pedestrian refuge islands will make these city centre streets more pedestrian-friendly. “Safety is paramount. We’re committed to making our streets safer and easier for people to get around,” says Miss King. 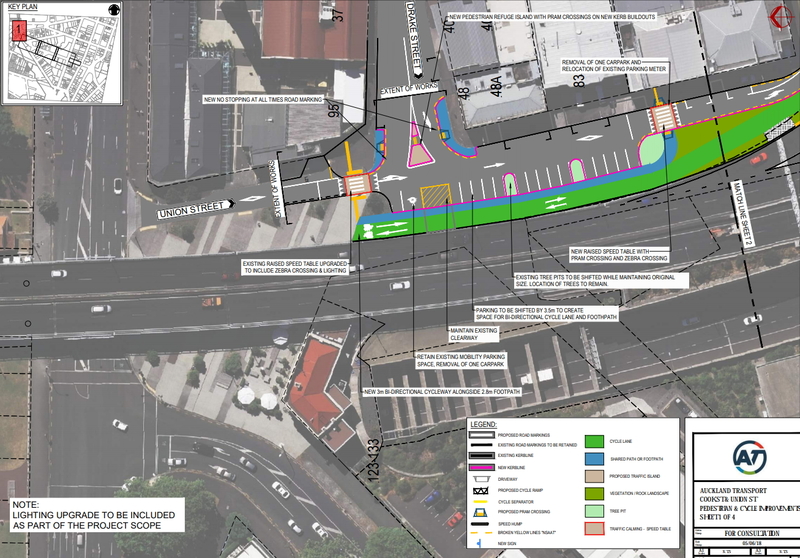 Under the proposal, a network of on-road cycle lanes and shared paths are planned from the upcoming Victoria Street cycleway via Union Street to Sale Street, onto Cook Street then connecting to the Nelson Street cycleway. At the intersection of Cook and Morton streets, electronic driver speed feedback signs will help to reduce traffic speeds while a new traffic island on the northern side of Cook Street will make it easier for pedestrians to cross. The proposal also includes lowering high-traffic speeds exiting the Northern Motorway off-ramp onto Cook Street by reducing and narrowing road lanes. 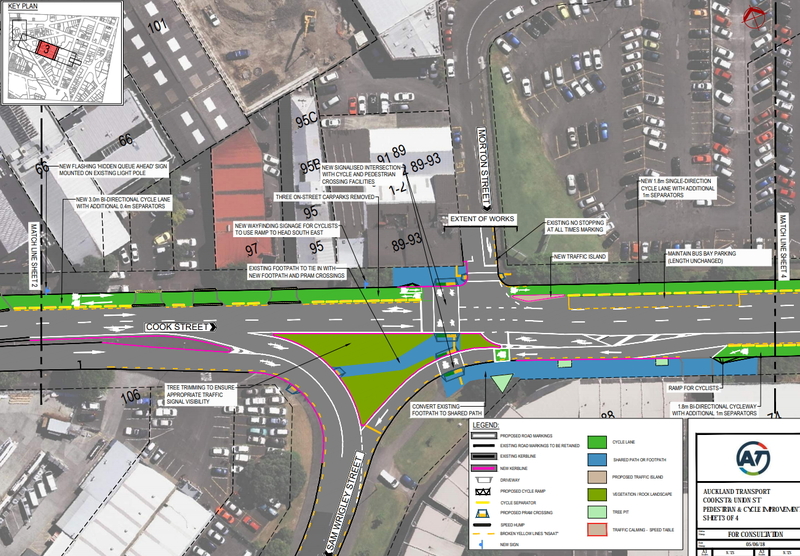 In addition, an extra lane would be added on Sam Wrigley Street to make the intersection with Cook Street safer for all road users, particularly for the Auckland Motorway Association whose heavy service vehicles currently have difficulty entering the street due to the fast-moving traffic exiting the motorway. “We have spoken to key stakeholders and people living and working in the area to balance the demands of people travelling through the area and people staying to enjoy the area. The key focus is creating safe and healthy streets that work for everyone,” says Miss King. This is good news. So here’s what’s proposed. The most will be where Union St joins both Sale St and Cook St. The southbound lane onto Cook St will be removed and the road network more squared up which will help lower speeds and therefore improve safety. The cycleway from Union St will fill some of this space. The lanes on Cook St will be reduced to reflect that there’s only a single lane on the off-ramp and road surface coloured to help slow vehicles from the motorway down. There is also a new shared path and a pedestrian crossing at the end of Sale St. The bi-directional cycleway will continue along till it reaches a new pedestrian and bike crossing next to Morton St where the east and west directions are meant to separate. The cycle lanes will continue up to Nelson St giving another safe option for getting between Nelson St and Victoria Park. Finally, a one-directional cycleway will be added to the east of Nelson, but it is only a short section, as the image below shows. This is expanded upon in more detail below. Overall the proposal is pretty good – although there are always places to improve something. One such example is in the right of the image above between Nelson and Hobson streets. AT are actually planning on adding on-street parking here, as with the exception of the two closest to Hobson St, the road has no stopping lines currently. Why not extend the cycleway all the way to Hobson St or are they still saying that a few carparks are more importing than the safety of those on bikes? If we’re going to the extent of putting a cycle lane here, then why not just do it properly. The consultation on these plans closes on 28 June. Fantastic news. Well done, David. Parking: For an area so well-connected by public transport, they need to be removing parking as a traffic-lowering exercise. As we know from the Dutch, you have to actually lower the traffic volumes to make a cycle network safe, and parking is an obvious choice in this area. So to ADD parking there on Cook St instead of continuing the cyclelane is a bit mad. I worked in this area for a number of years. Yep the footpaths are atrocious. Cars would park all over them preventing pedestrian access. Buses would park in front of the northern side of cook street, in the clear way because there was no room further up. Which was a huge PITA because cars coming off the motorway couldn’t see over the rise in Cook St. Saw a car flip and end up on it’s roof one time heading up Sam Wrigley St… too fast. Many near misses on Morton St trying to see around cars. – I am a little disappointed at the footpath work stated above – I have to assume they just omitted it when getting excited about the cycleway. – There’s no allowance for more buses, so I wonder where they’ll go? – Very excited about the crossing across Cook St, because there’s nothing worse than trying to cross that road when there’s 2 lanes of motorway traffic coming at you. – And hopefully reducing the lanes coming off the motorway will mean no reducing the height of that rise in cook st to the East, which is a significant visual barrier, at least for pedestrians trying to cross without a crossing. I wonder if AT could present to us their review of this area and give us their reasoning for why this area does not quality for 30 km/hr, being a high pedestrian use are and part of the CBD? I wonder what their definition of priority is? I would say the CBD ‘review’ and the install of new signs should take less than a week.I imagine they are thinking more in terms of years? Legally you have to go through a public consultative process to introduce new speed limits; you can’t just slap up some new signs overnight. Wouldn’t a safety obsessed government change that requirement? We are talking about lowering speed limits in the interests of safety, why the need for a consultation? Crazy stuff! Required for each street, I’m told by the local board. Hopefully changing…. Please give feedback around the footpaths – that’s all I asked for originally and is the big thing still missing! Am I right in thinking that the traffic turning right from Cook St into Sam Wrigley now gets two lanes instead of one, and there is no way to cross for pedestrians… isn’t this a step backwards? Placemakers is THE hardware shop for all the apartment dwellers in the cbd, is it not? Surely they’re not assuming that its only customers are drivers? That is correct, I’m still torn on this. The original issue I raised was that cars coming out of the placemakers would be looking far left over their shoulder and potentially accelerating aggressively without looking in front of them – a poorly timed pedestrian crossing attempt at such a time could go badly. Basically, NZTA won’t allow any stop phase here as they think it will back up to the motorway. 2. Squeezing two lanes in means that cars should in theory have to take the corner more slowly to stay in their lane. I’m not sure how 2 will play out – vertical barriers could help here, just need to cut into the island ~50cm? I’ll probalably put that in my submission – would provide emergency stopping space for pedestrians too. I wanted to sharpen this corner, but it would result in losing one of the lovely trees. Hopefully there is a general reduction in speeds as a result of the other design elements that helps. But are NZTA allowed to prioritise the motorway flow over the safety of pedestrians here? Apparently? I could never get Phil Twyford or Julie Anne Genter to respond to my petition for the area asking for exactly that – either they don’t care or it’s not a priority. Same for Nelson, Union etc. NZTA are effectively *required* to do that. Their remit is the state highway network, and keeping it flowing. What happens just past the off ramp is someone else’s problem they’re not allowed to deal with. Unfortunately that can lead to some terrible outcomes at the interface between state highway and city streets. So a pedestrian crossing where we’re proposing is just after the off-ramp, and not part of their remit, correct? This whole design had to go to NZTA for approval – anything that effects the motorway they have control over, including things backing up onto the motorway. NZTA’s being particularly sucky, given that they made us pay for the Victoria Park to Newmarket widening, which their own review shows did not deliver the benefits promised (and this is due to their own incorrect traffic modelling) but did induce traffic through this area, increasing the danger to vulnerable road users. Seems to me AT should stop allowing themselves to be bullied, and both agencies need to deliver on their remit to provide safe roading infrastructure. Expensive but, there is likely enough of a grade change there to put the off ramp in a ditch (1 lane) and build over it to connect the 2 sides of Cook St. So yes, in the longer term removing the motorway and putting any remaining arterial roads underground in the CBD are necessary if Auckland wants to aspire to be even vaguely back in the running as a well-planned, liveable city. In the short term, AT just has to stand up to NZTA in situations like this and insist on slow speeds and safe pedestrian infra. Perhaps with regard to motorway traffic entering urban streets, AT should adopt the mantra of progressive stormwater engineers: “Stop it. Spread it. Sink it.” Ha ha. It is interesting to compare the rationale you outline to their approach with the Waterview Tunnel and speed limits. They dropped the speed limit 20km/hr over 2 kms from the tunnel, including for traffic on SH16 not going anywhere near it. They justified this as “worldwide best practice” to have 80kmh on approaches to tunnels, to reduce the risk of crashes. Imagine if AT and the NZTA applied the same standards whenever traffic was in the vicinity of much more vulnerable road users like CBD pedestrians and cyclists. Is anyone aware of documented international best practice where this is done that could be shown to them? It’s like the traffic engineers feel they fail if cars crash on their network, because that’s been fully designed by them. But pedestrians aren’t really in the game; they don’t fail if pedestrians get hurt, because that could happen anywhere. Or something. Best practice is that where physically separated cycleways are not provided, the speeds should not be over 30 km/hr. No NZTA are not allowed to do that but they will claim they are allowed. It is true their role is to keep the motorway flowing. But outside of the State Highway, AT is the road controlling authority. 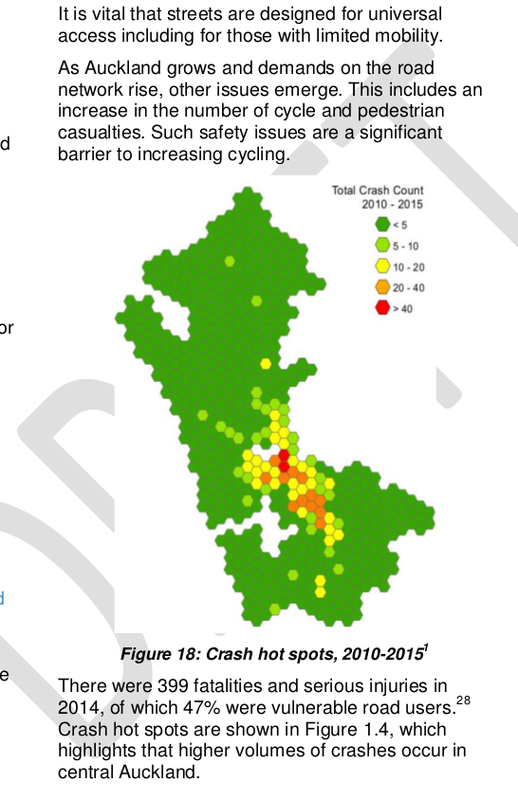 NZTA is a neighbour AT needs to consult with. If AT wanted a stop phase then all they need do is design one and tell NZTA that is what they are going to do. AT is allowed to be just as bloody minded as NZTA usually is. Except that NZTA are also the funding allocation body that decides how much money AT gets for major projects. Which is supposed to be at arms length from the operational side. It isn’t to give them a veto over traffic management. Sure supposed to, but when you hand funding allocation to the old Main Roads Board what do you think happens? Then don’t apply for money from NZTA. Just put in a signalised crossing or a signalised intersection. If you don’t apply they can’t say no. I’m not talking about applying for money for a crossing, I’m talking about the next application for a major project after they put in the crossing that the funder hates and said they shouldn’t put in. Is this fear well-founded, Nick, and NZTA really are vindictive like this? Or is AT hounded into this position through a learned culture of subservience that hasn’t actually been tested? I don’t think it’s especially vindictive, more just pragmatic when they have a small and defined goal. “Last time you guys really screwed over our network when you did your project, we think your next project might do the same”. I’m all for ped & cycle safety but a backed up motorway is pretty dangerous for all drivers & passengers on the motorway I would think, esp if hidden queues around corners etc? Just thinking out loud, question of balance I would think. A backed up motorway is just part and parcel of the induced traffic that comes from road building. Driving makes environments unsafe. Kind of crazy to transfer that – instead – to the vulnerable road users. Interestingly a number of motorway off ramps back-up onto the motorway at times. If NZTA we really concerned about motorway users safety they would hold all traffic approaching the intersections at the top of the off-ramp to ensure that the off-ramp continued to flow. But they don’t. Closing the off-ramp is another way to solve this, seems the average daily traffic taking the off-ramp is ~8-9,000 vehicles per day around 2015. Thing is where would they then exit? Fanshawe St generally, creating more traffic up through other areas, though I would expect a bit of reversal of induced demand in doing this. @ Jezza – True. They seem to punish traffic going towards Otahuhu direction with the light phasing to prevent queuing on the motorway leading to Mt Wellington off-ramps I have figured. If you go north on Mt Wellington Highway, it’s a lot quicker than going south under the motorway. David, can you explain why the motorway traffic that wants to go up Union St has to go around Placemakers anyway? Why doesn’t it choose between going up Union St or left into Cook St? Then there could be no right turn from Cook St into Sam Wrigley apart from the slow Placemakers traffic, and a pedestrian crossing would be easy. The original ‘plan’ (in the city centre master plan from 2012) was to realign the off ramp up union street and restore a sensible street grid. That was prevented by AT selling the corner parking lot (immediately on the right as you come off the motorway now) to NZTA for AMA use (motorway response unit, effectively). There is still talk of this, and this solution being ‘temporary’, but it’s all caught up with the AWHC route protection. Agree with all those who have expressed scepticism about footpaths in the area. I regularly walk down Union Street toward Victoria Park (easiest place for me to catch North Shore buses) and feel that I am taking my life in my hands crossing the motorway off-ramp AND Cook Street, which have to be negotiated in one step, and even after that, having to walk across soggy grass and/or a car park. Not very conducive to walking. C’mon, AT, what about us who like to walk? I’m raised people crossing here and there is no way anyone was going to provide any facility – it’s seen as too dangerous and providing the option makes the designer culpable. 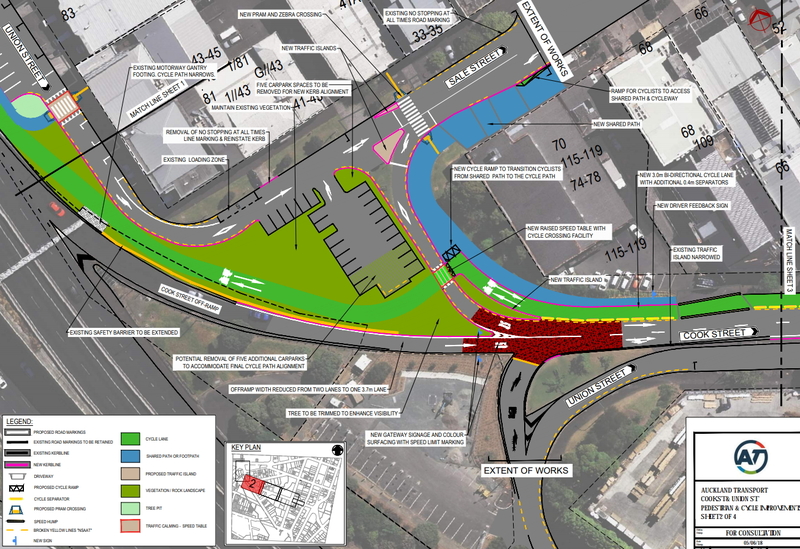 The narrowing of the offramp and the removal of the Union street ‘on ramp’ from vicpark will make this informal crossing safer overall though. This seems a positive interim plan, though it begs the question when will the Cook Street off ramp be closed? As the Victoria precinct increasingly becomes a residential quarter its hard to see the malign street environment dramatically improving for pedestrians and cyclists while being dominated by drive through motorway spilloff. what I wouldnt give for cycleways like this to start appearing in the capital. Might have to move to Auckland at this rate. Great work to get this in. So next step is completing the section to Mayoral Dr I guess to connect with Federal St improvements & Vincent St cyclelane. Bi-directional cycleway beside a one way road. 4 vehicle entrances/exits crossing the cycleway. Danger, drivers will not be checking both directions. Totally agree and it should be a protected cycleway.